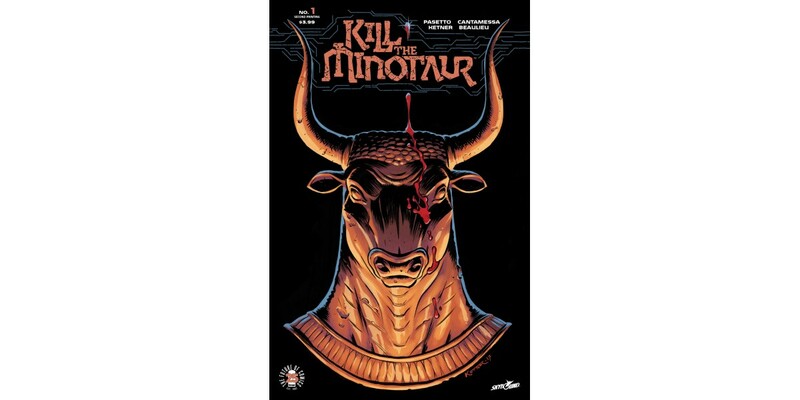 Image Comics and Skybound Entertainment are pleased to announce that the new hit series KILL THE MINOTAUR, from video game and film writers Chris Pasetto (Sanitarium, co-writer of feature film Air) and Christian Cantamessa (Red Dead Redemption, co-writer and director of Air) and comics artist Lukas Ketner (WITCH DOCTOR), is being rushed back to print to keep up with customer demand. Athens lost the war to Crete. Now, they must pay tribute to King Minos by sacrificing their best citizens to his unearthly labyrinth and the terror within. Conspirators believe Theseus can be the hero they so desperately need to end the mad king’s bloody reign...but no one in this world has ever encountered anything like the savage minotaur. KILL THE MINOTAUR #1 remains available for purchase across all digital platforms, including the Image Comics website (imagecomics.com), the official Image Comics iOS app, Comixology’s website (comixology.com), iOS, Android, and Google Play.